Five years since fracking caused earthquake on the fylde coast... but could it happen again? The Preese Hall fracking pad where the drilling operation caused the earth tremors. Campaigners say the so-called traffic light system will not prevent further tremors caused by fracking and that seismic events could be larger than the ones which triggered the temporary ban. They say that since there would be no pre-shocks before a tremor is triggered when fluid is injected into the rock, the system would not actually prevent an incident. They also claim that the traffic light levels that Cuadrilla want to use could result in tremors of more than 2.5 due to an effect known as post event rise - a later increase in the magnitude of the tremor. They also say that the seismic monitoring system would be run by Cuadrilla staff themselves and therefore it would not be independent and the fact that Cuadrilla was slow in acknowledging that its Preese Hall operation in Weeton had caused the tremors did not give them any peace of mind. Neil Lewis of Station Road, Kirkham said he was woken up by the quake on April 1 ,2011. He said: “I did some research into the Preese Hall frack, and the DECC report was most illuminating. “The frack produced a quake of magnitude 2.3. When Cuadrilla finally got around to admitting it, they proposed that the traffic light be set at 1.7M. The British Geological Survey pointed out that 1.7M would carry a post-event rise of 0.9M (all seismic events carry this). So Cuadrilla actually wanted a 2.6M traffic light. This would, in effect, be bigger than the 2.3M quake they had just created! The Traffic Light System will let us know when things are going wrong. If they tell us! “The government proudly speaks of ‘gold standard, robust regulation and monitoring’, when in fact self-regulation is still the norm. The Environment Agency and Health and Safety Executive are seriously under-funded and under-staffed. Elizabeth Warner, chaiman of the Roseacre Awareness Group said: “Five years ago Cuadrilla caused earth tremors (the “Blackpool earthquakes”) which went unacknowledged. “The Government acted and called a halt to their operations and of course the official report named and should have shamed them. “The Cuadrilla record on the Fylde remains shameful: Anna’s Road, Preese Hall, Grange Road all started and then discarded; picked up and put down or, as with Grange Road, kept just in case. Six years on from their original planning application for 18 months Cuadrilla are still there, sitting on a further three year extension. John Powney, from the Ribble Estuary Against Fracking group, also said Cuadrilla had asked for a 1.7 magnitude limit. He said: “To get round this the British Geological Survey suggest a 0.5M max at which point operations will cease. Helen Rimmer, North West campaigner Friends of the Earth, said: “It is alarming that the tremors caused structural damage to the well, and that Cuadrilla failed to report this to the Government for six months shows the failures in the regulation of the fracking industry and that Cuadrilla can’t be trusted with Lancashire’s environment. John Bailie, of Poulton, said: “During the recent six-week appeal inquiry, when describing the process of drilling for shale gas (fracking), Cuadrilla CEO Francis Egan stated that, ‘We will do this safely. We will do this responsibly’. “But presumably they thought they were carrying out the fracking process safely and responsibly five years ago, when Mother Nature took them by surprise and instigated the earth tremors. Claire Stephenson, from the Preston New Road Action Group, said: “It’s been five years now since the earth tremor shook Blackpool and far beyond. “And in a way, it’s lucky it happened. It raised many serious questions for a number of people on the Fylde Coast to fracking, the process, effects on both environment, climate and human health, and more importantly, the company behind it. “The numbers against fracking in our county have grown tremendously, with over 40 groups in Lancashire alone, and counting. “The resistance to this dangerous and climate-damaging technology must not be underestimated. Our concerns into the health and wellbeing of our community and others under the threat of fracking is escalating by the week, with studies pouring out of academia presenting enough compelling evidence to at least warrant an immediate moratorium, if not an outright ban. Fylde residents recalled the night five years ago when their world was shaken by hydraulic fracturing. John Hodgson, of Brocklewood Avenue in Poulton, was in bed when the 2.5 magnitude tremor struck on April 1. He said: “There was a very very loud noise like thunder and the house started shaking. “I have a clock that shines the time onto the ceiling and I immediately saw it was 3.30 am. “The bed was shaking from left to right and it went on for about 10 to 15 seconds. There was a bang as something fell off a bedside table. “I rushed downstairs as I thought it might have been a bus or something running into a house. “I could not see anything. It was later that morning when I heard on the radio there had been an earth tremor. “Later we noticed the bathroom floor was wet. We had a hairline crack in the porcelain of the toilet. “If there are to be many more wells across the Fylde, I would be extremely concerned that there could be many more tremors. Dawn Ansell, of Weeton, said although they have four children her husband can usually sleep through any noise. She said: “But when it happened he sat bolt upright in bed. The whole house shook. “When we got up there were fracture lines through the grouting between the tiles in the bathroom. “We had cracks in the ceiling. The house is only about 50 years old. “We had no idea about fracking before this. We did not really know what was going on at Preese Hall, fracking had never been mentioned. We made sure we knew about it after that. “There are too many houses and businesses in the Fylde and Lancashire for fracking to go ahead. Cuadrilla has a 100 per cent failure rate so far, it does not bode well for the future. “There are no ‘gold standard’ regulations only self regulation . Gayzer Frackman was another who had never heard of fracking before the earthquakes struck in 2011. After that he started researching the issue and began protesting, even changing his name by deed poll to highlight the issue. He said: “ I was awake doing some work for my children’s entertainments business when the earthquake shook the house. “It was months later that Cuadrilla admitted they caused the quake and then the report came out. That’s when I started researching fracking in the USA. “I had been painting the roof and when I went out that morning there were cracks in the brick walls. “Later I noticed cracks inside the house in a cupboard. “It resulted in the moratorium which should never have been lifted. The traffic light system will not stop any quakes, they will have already happened when they inject the fracking fluid. Mr Frackman said he would be spending today at Downing Street protesting against fracking on the fifth anniversary of the quake. Neil Lewis, of Kirkham, said: “I’m a sound sleeper, but I was awoken at about 3 am by a tremor so strong that I thought the mirror and pictures were coming off the walls in my bedroom. “In 40 years on the Fylde I’d never experienced anything like it. “There was very little community awareness at the time of this, Cuadrilla’s first high volume hydraulic fracturing in the UK, and Cuadrilla purposely neglected to report the problems with the Preese Hall frack to the HSE and other regulatory bodies. Fylde MP Mark Menzies said: “It is astonishing that it is already five years since the tremors occurred at Preese Hall which led to the Government introducing a moratorium on shale gas exploration. “Since then I have repeatedly made clear my unwavering position that the most stringent regulations be in place if further exploration is to go ahead. 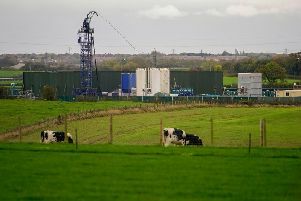 Francis Egan, chief executive of Cuadrilla, said regulation would prevent any tremors of the kind seen at Preese Hall. He said today: “It is very clearly stated in the regulatory guidance from the Department of Energy and Climate Change that for any future shale gas exploration we will need to put in place a traffic light monitoring system which if it detects a tremor of magnitude 0.5 or greater then operations will need to be immediately suspended. “We will of course abide by this. “This will ensure that the larger tremors experienced at our Preese Hall site in 2011 will not happen again albeit that they caused no material damage and were only allegedly felt by a small number of people. Onshore gas industry leaders said today the regulation regime proposed if shale gas extraction goes ahead was far more rigorous than EU guidelines. Ken Cronin, chief executive of the United Kingdom Onshore Oil and Gas group, said: “Following the moratorium imposed after the seismic event, DECC introduced a traffic light monitoring system, the key element of which is that if a tremor of magnitude 0.5 or greater in the Richter Scale is detected this triggers a process that can lead to operations being suspended. “The Infrastructure Act, passed last year set an even more demanding regime. Every individual frack will require a High Volume Hydraulic Fracture Plan to gain consent from the regulators - the Environment Agency and the Oil and Gas Authority plus Health and Safety Executive on well integrity. “Operators will be required to confirm that wells are not to be drilled into, or close to, existing faults which could provide the mechanism for triggering an earth tremor. “Background seismicity and ‘real time’ seismic monitoring will be used before and during activities and a “traffic-light” warning protocol will be employed. According to the British Geological Survey, this magnitude is well below the level that could be felt at the surface. According to the British Geological Society, an earthquake is only considered to be ‘significant’ should it measure above 4.0 and an earthquake measuring below 3.0 is generally not felt at the surface, let alone the cause of any damage. The industry agreed to be bound by the DECC guidelines and, of course, is bound by the relevant clauses in the Infrastructure Act.